Here is your ultimate deal of the weekend. 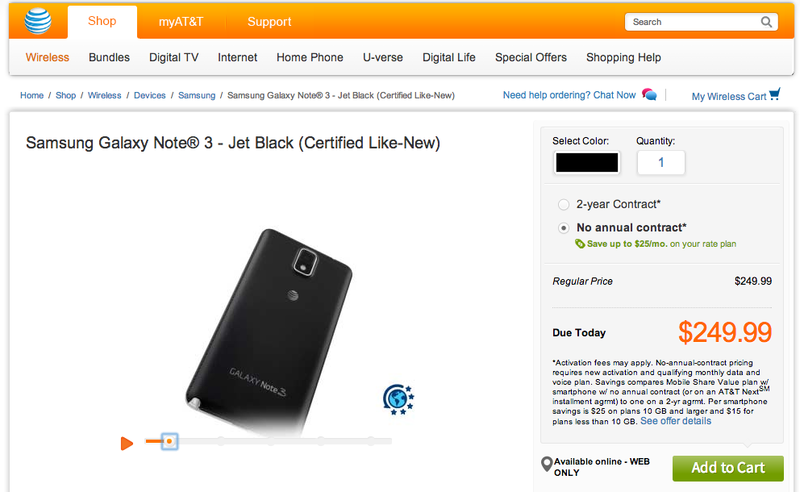 AT&T is currently selling a “certified like-new” Galaxy Note 3 for $249 without a contract. Yes, we’re talking Note 3, not Note 2. This is the same Note 3 that typically runs $299 on-contract or $699 full retail when brand new. Pretty tough to pass on, especially if you are in the market for a almost-new phone. I should point out that AT&T’s website does require you to add a wireless plan in order to purchase the phone. If you are already on AT&T, though, might be worth a look.